This past winter, we ate more pasta than we usually do. I've said before that it's not that we dislike pasta, there are just a lot of other foods we gravitate toward first (unless we're going to Pastaria...then I am ALL about the Pasta!). I'm not sure if it was the exceptionally cold weather, or the laziness that set in near the end of my pregnancy, but I began to love how easy it was to throw together a pasta dish for a quick dinner. 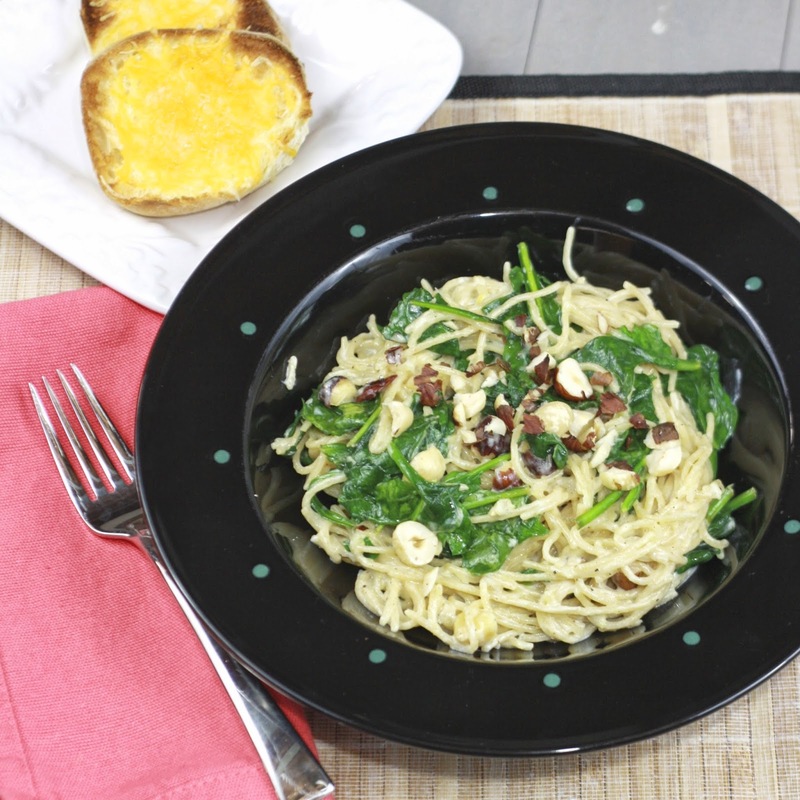 This spaghetti dish was one of my favorites! The lemon in here makes it well suited for spring and if you can't easily get mascarpone cheese, you could likely sub with goat cheese or even ricotta. I happened to have hazelnuts on hand which added fantastic flavor, but walnuts would also work. 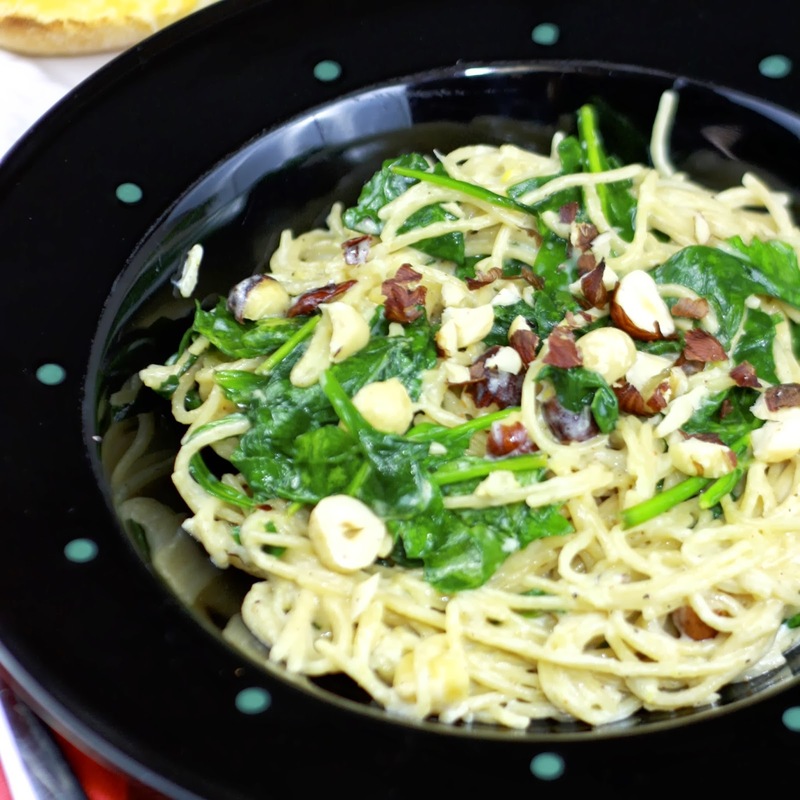 In about twenty minutes you'll have yourself a tasty pasta dinner that's far better than tossing spaghetti noodles with a jar of sauce! 1. In a small bowl, combine the lemon zest, lemon juice, mascarpone, and nutmeg in a bowl. Season to taste with salt and pepper and whisk to combine. 2. Salt a pot of water generously and bring to a boil. Cook pasta until al dente. Drain, reserving 1/2 cup of pasta water. 3. Return the spaghetti to the pot and put over low heat. Stir in the mascarpone sauce. Add the spinach, tossing to wilt spinach. Add 1/4 cup of pasta water (more if necessary) to loosen sauce (you want it fluid but not watery). Continue to toss and cook until spinach is cooked. 4. Stir in hazelnuts and serve immediately.